April 11, 2019, brought us a new word for Judas: Moreno -- the puppet president of Ecuador who sold Julian Assange to Washington for his 30 pieces of silver. This morning's arrest of Assange inside the Ecudoran embassy in London is the first stage in Washington's attempt to criminalize the First Amendment to the U.S. Constitution. Washington's man in Quito said he revoked Assange's political asylum and Ecuadoran citizenship because Assange engaged in free speech. As race and gender diverse police dragged Assange out of the embassy this morning, I reflected on the utter corruption of three governments -- the U.S., the U.K., and Ecuador -- and their institutions. If the British parliament had any integrity, they would have blocked London's contribution to Washington's upcoming show trial. If the British had a prime minister instead of a Washington agent, Assange would have been released a long time ago, not held in de facto imprisonment until Washington found Moreno's price. President Trump has survived a three-year ordeal similar to Assange's seven-year ordeal. Trump knows how corrupt US intelligence agencies and the U.S. Department of Justice (sic) are. If Trump had any integrity, he would bring the shameful and embarrassing persecution of Assange to an immediate end by issuing a pre-trial pardon. This would also end the illegal re-imprisonment of Manning. When the Justice (sic) Department does not have a crime with which to charge its intended victim, the department trots out "conspiracy." Assange is accused of being in a conspiracy with Manning to obtain and publicize secret government data, such as the film, which was already known to a Washington Post reporter who failed his newspaper and his profession by remaining silent, of U.S. soldiers committing extraordinary war crimes without remorse. As a U.S. soldier, it was actually Manning's duty to report the crimes and the failure of U.S. troops to disobey unlawful orders. Manning was supposed to report the crimes to his superiors, not to the public, but he knew the military had already covered up the massacre of journalists and civilians and did not want another My Lai-type event on its hands. I don't believe the charge against Assange. If Wikileaks cracked the code for Manning, Wikileaks did not need Manning. 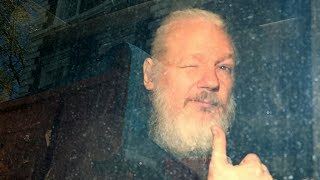 The alleged Grand Jury that allegedly produced the indictment was conducted in secret over many years as Washington searched for something that might be pinned on Assange. If there actually was a grand jury, the jurors were devoid of integrity, but how do we know there was a grand jury? Why should we believe anything Washington says after "Saddam Hussein's weapons of mass destruction," "Assad's use of chemical weapons against his own people," "Iranian nukes," "Russian invasion of Ukraine," "Russiagate," and on and on ad infinitum. Why believe Washington is telling the truth this time?